It seems all of us bloggers are ready for Spring and looking for any hopeful signs. You found some great hope here to share. Have a wonderful week Mary! Great mosaics Mary, I also love this time of year. Rebirth is so special. I am sorry I missed your post concerning your father-in-law, my father also suffered from multiple myeloma. My thoughts and prayers are with you during this difficult time. Take care. My goodness - I hope your father-in-law makes a speedy recovery. That is just too many things to be fighting at once! Your mosaic is really pretty, and cheer me up for we have nothing blooming just yet. Hi Mary! Love blooms and you always make gorgeous mosaics. Sorry to hear about your FIL. Signs of spring are popping up everywhere. 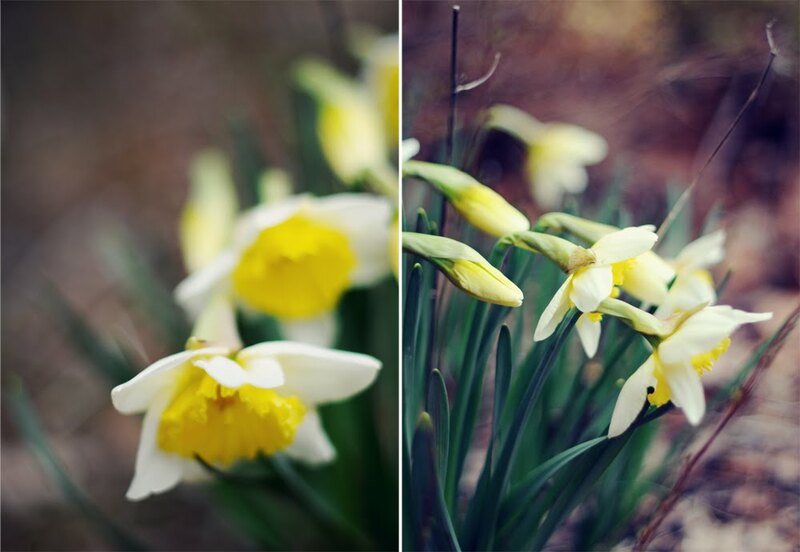 Daffodils are so cheery and bright. Sorry to hear about your father-in-law. It's hard on everyone in the family. I hope this week goes well for you. Oh you're a spring girl... I am not surprised. And your second season must be autumn. I think. Mine are reversed. Spring is my second favorite and autumn my first. Beautiful photos~ Thoughts & prayers with you & your family. What a beautiful start to Spring! We're getting there, too! My thoughts and prayers go out to your family. Beautiful spring shots Mary! Hoping your FIL gets well soon. It looks like we're a couple of weeks behind you and I can expect to see daffodils soon. How lovely, Mary. I can hardly wait to see all these beautiful colours here in East Gwillimbury! so clean, so April! Beautiful, hope your FIL is fairing well. the emergence of spring is such a glorious time. I can see you are going to enjoy every moment of it. Thank you again for the opportunity to share through Mosaic Monday. Thinking of you and your family at this terrible time ... it is a hard time but together I'm sure you will get through it all. My heart goes out to your father-in-law as he really is battling on so many fronts. Your signs of spring mosaic is a beautiful thing ... I'm sure it's a real joy to finally welcome your spring. What beautiful photos. I'm sure you are so welcoming of spring this year after such a hard winter. Enjoy each and every blossom! I'm keeping your father-in-law in my thoughts, Mary. My sincere wishes for his recovery go out to you and your family. Rejoicing with you that spring has sprung. I hope your father-in-law recovers quickly and that you all know God's presence throughout this difficult time. A wonderful Spring at your Little Red garden!Prayers for your Father.I.L. Mary, your mosaic is so beautiful. It makes me crave spring even more. Crocuses and daffodils, the harbingers of spring, cheer the soul and brighten the days. Beautiful as always. Mary, thanks for hosting "Mosaic Monday". I have such a great time creating collages of favorite pictures to share. i am just reading today - my thoughts and prayers are with you and your family. Beautiful signs of spring Mary! Thank you for bringing us all together each week! The spring can not be stopped anymore! yippieh! Finally you can spend the day in the garden, lying on the lawn and barbecuing. Nothing is more inspiring than Spring! Beautiful! Really beautiful, Mary. I'm glad you are getting some flowers now. I do hope your father-in-law pulls through -- what a week you had. Here's hoping you have a better one this week! Lovely pictures. Spring is such a hopeful season. Nice mosaic. How I wish we have the spring season here in the UAE so that I could take some photos of the flowers too. Beautiful signs of spring! We are having a wet spring, but the plants still do their thing. So sad to hear the news about your father-in-law. I am keeping your family in my thoughts and prayers at this difficult time. Sending you a wish for a speedy recovery, it is harder when you are older. You gave me inspiration to make my own spring mosaic...Lovely season, isn't it? Your spring blooms are ahead of mine. How lovely to see the flowers. 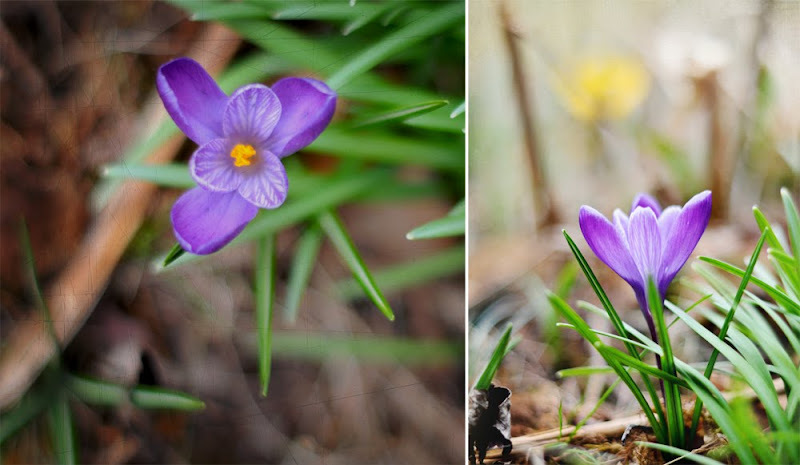 Crocus are one of my spring favorites, because they are the first to bloom. We had spectacular weather this past weekend. It was 85* here yesterday. WOO-HOO! Hi Mary, how good of you to still host Mosaic Monday when your FIL is so ill. You know that all your blogging friends are thinking and praying for you all at this time. Funny when I found the poem online to go with my mosaic I never realised that it mentioned Mary until after I had posted!! God bless, Jackie in Surrey, UK. Glad spring has finally arrived at your house. Here the dafs are gone but tulips and dogwoods are blooming with azaleas. Isn't this a magical time of year when all the plants and flowers burst into glorious colour. Many thanks for hosting MM. Your family are in my thoughts at this difficult time. Thanks for hosting Mosaic Monday and for sharing your beautiful photos. Thoughts are with you and your family and improved health for your FIL. Late start for me today. Your flowers are beautiful and we also have spring finally. Wonderful photos too. Thanks Mary. I have some one to send to your mosaic tutorial. Beautiful flowers! I've been seeing this photo meme around for months but just now joining for the first time. Just found the mosaic maker on my editing program!! Yippee! I enjoyed seeing your touches of Spring - very pretty. Happy Monday to you Mary! Lovely photos! Thanks for giving me the chance of adding my link. Yellow and purple flowers are my favorite! My husband often buys me that color combination. These are beautiful. Such beautiful photos as always -- your focusing and framing perfectly capture the misty essence of spring.